The team at Vigil Games started with the ambitious Darksiders, a title that took some of the industry’s best game concepts and brought them together. God of War, The Legend of Zelda, Portal; all of these were a major influence in the studio’s first major release. With the sequel, Vigil has fleshed out these concepts and added new RPG mechanics like loot and leveling. 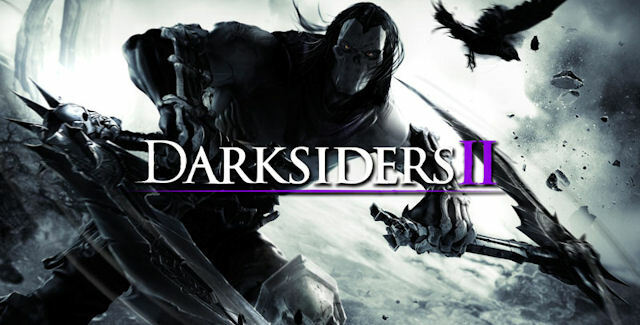 This new mash-up creates Darksiders 2, one of the most enjoyable games of 2012. Darksiders 2 might be enjoyable to play, but the game’s story is a major letdown. The first Darksiders ends with an epic climax: War breaks the final seal and the other three Horsemen ride to fight by his side. The sequel takes place concurrently to the first game, so the story doesn’t move forward at all, crushing any excitement for seeing all four Horsemen riding into battle together. While War is imprisoned by the Charred Council, his brother Death goes on a quest to un-reap the souls of the living and help clear his brother’s name. Along the way, good-natured Death decides to stop and help every character with their problems so they will give him an item he needs or point him in the direction of his next task. This results in doing a staggering amount of fetch quests just to get one step forward in the main quest. Death is less of a badass and more of an errand-boy character. Not until the final battle did Death ever do anything meaningful, but his agility and skill set makes this 20-25 hour journey extremely gratifying. Combat in Darksiders 2 is easily the game’s strongest aspect. Employing a combo-dense light and heavy combat system, Death is a master at achieving his namesake. Death is far more spry than his brother, which makes dodging enemy attacks and chaining high-numbered combos incredibly fast, fierce, and fun. Chaining together main and off-hand weapon attacks is seamless and fluid, offering a sense of depth akin to a Devil May Cry. If an enemy is far away, pull him closer with a deathly grip. Employ the help of dead souls to fight alongside Death and turn a losing battle in your favor. Combat never feels frustrating and never feels like the game did something you didn’t tell it to do. 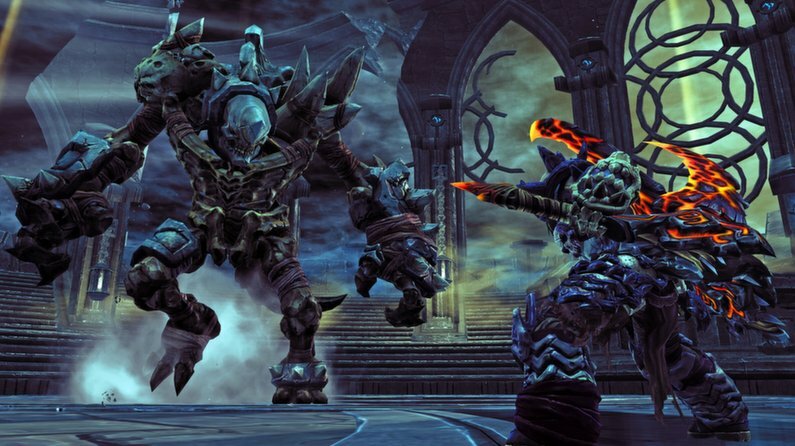 I was consistently excited when a new group of enemies appeared just so I got to enjoy the thrill of Darksiders 2’s combat again and again. Death’s agility also helps in traversal as well. Quickly climbing up ledges and running along walls lets Death access regularly inaccessible areas of the decaying world. You can use these traversal skills to find hidden areas and items in the huge overworld. When not dwelling in dungeons, Death traverses a vast, empty landscape that is needlessly large. It takes too long to get from point to point, and even though there is a fast travel system in the game, it still feels like you do more running and horse riding than necessary. There are some random small dungeons in the overworld that have a puzzle or two and a loot chest at the end, which is a nice edition; but most of the world is just empty of any kind of life. The dungeons of Darksiders 2 stick to the tried and true formula of fire, water, time, and other various themes based on abilities gained within the game. Most of the dungeons are fun and challenging, except for one that turns the game into a boring third-person corridor shooter that just isn’t satisfying and goes on for far too long. While puzzles might use the same type of mechanic, such as moving a large ball into a socket across the room, the variety lies in how you need to get that ball into that socket. Later puzzles get more interesting as you split Death’s soul in two, giving you two player characters to move into position on pressure plates, or direct beams of energy; some puzzles even use the portal gun from the first game. There are a few head-scratching puzzles in the second half of the game, but solutions never seem impossible. Environments have an astonishing breadth of detail and incredible art. Each area has a unique look and feel completely different from what preceded it. Death himself always looks as badass as possible, no matter what interchangeable armor and weapons you give him. Everything from the combat animations, to the fantastic scale of some bosses, looks ripped out of a stylized comic book. A New Game+ option, the Crucible arena, and ever-present loot drops give Darksiders 2 great replay value. Vigil Games has crafted a sequel that fixes many of the problems with the first game, and adds new mechanics that only make the experience even better. Regardless of the completely lackluster story, Darksiders 2 is just an incredibly fun game. Now, if you’ll excuse me, I’m going to go play more Darksiders 2. Enjoyed your review of Darksiders II Clint. I know you had huge issues trying to get the game to boot up haha! But all in all, the game sounds fantastic. I have yet to open it up, trying to finish a few other games, but once I do I plan to play the crap out of it!